The Thirty-fifth United States Congress was a meeting of the legislative branch of the United States federal government, consisting of the United States Senate and the United States House of Representatives. 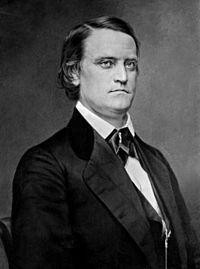 It met in Washington, D.C. from March 4, 1857, to March 4, 1859, during the first two years of James Buchanan's presidency. The apportionment of seats in the House of Representatives was based on the Seventh Census of the United States in 1850. Both chambers had a Democratic majority. March 3, 1859: Financial appropriations for the improvement and construction of lighthouses. 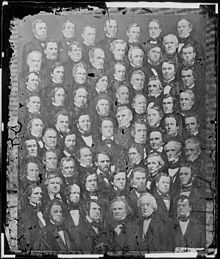 Group photo of the U.S. Senate, in 1859, during this Congress. During this congress, two Senate seats were added for each of the new states of Minnesota and Oregon. During this congress, two House seats were added for the new state of Minnesota and one House seat was added for the new state of Oregon. Senators were elected by the state legislatures every two years, with one-third beginning new six-year terms with each Congress. Preceding the names in the list below are Senate class numbers, which indicate the cycle of their election. In this Congress, Class 1 meant their term began with this Congress, facing re-election in 1862; Class 2 meant their term ended with this Congress, facing re-election in 1858; and Class 3 meant their term began in the last Congress, facing re-election in 1860. (1) Vacant Legislature had failed to elect. (3) Andrew Butler (D) Died May 25, 1857. (3) James Bell (R) Died May 26, 1857. (1) Thomas J. Rusk (D) Died July 29, 1857. (3) Asa Biggs (D) Resigned May 5, 1858, to become judge of the U.S. District Court for the District of North Carolina. Successor appointed May 7, 1858. (2) Josiah J. Evans (D) Died May 6, 1858. (1) J. Pinckney Henderson (D) Died June 4, 1858. (2) Arthur P. Hayne (D) Interim appointee retired. ^ a b c d United States Representatives were elected statewide on a general ticket. ^ The 35th Congress discontinued the custom of electing a Senate chaplain, choosing instead to invite the clergy of the District of Columbia to take turns opening the daily sessions with prayer. ^ "Senate Chaplain". Art and History. U.S. Senate. Retrieved 2013-11-09. 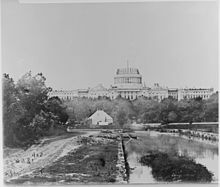 The 35th Congress (1857-1859) discontinued the custom of electing a Senate chaplain, and extended an invitation to the clergy of the District of Columbia to alternate in opening the daily sessions with prayer. The 36th Congress returned to the former practice. Congressional Directory for the 35th Congress, 1st Session.